When it comes to renovations, it’s best to talk to a pro. 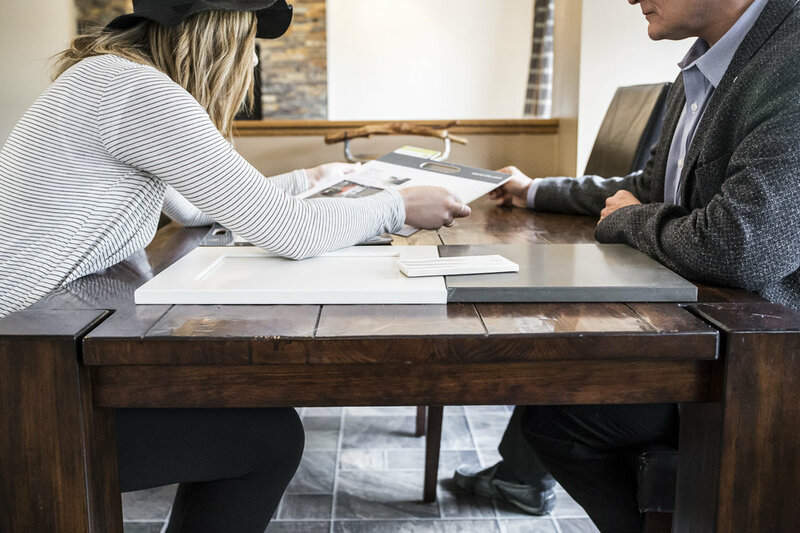 Even if you don’t have your own interior designer on speed dial (yet), once you start planning a renovation, it’s easy to see how a little professional advice can go a long way. Luckily, Jostar has you covered with sound advice as you plan your next Edmonton renovation project. Read on for an in-depth interview with Laura, one of our design experts. What’s the first thing you plan when you start a new renovation project? We put together an ideal schedule and establish deadlines that will help us get the project completed on time. 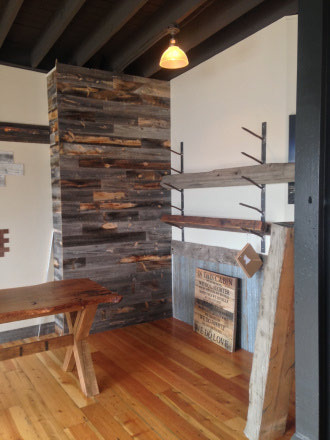 We also have to plan appointments with the clients where we finalize the materials, selections, and fixtures. Sometimes certain items take longer to come in than others, so we need to ensure we select and order everything in time to keep things moving. There are often unforeseen circumstances that delay the project, but having a schedule from the very beginning helps us, as well as the trades and the clients, know how to plan and what to expect. How do you balance client ideas with your professional expertise? One of the biggest challenges can be giving the client exactly what they’re looking for, but also providing them with the most functional and beautiful design for their space. I try to give them ideas they may not have thought about before, while always keeping in mind their style and what they need from the space. If they have an idea I know just will not work at all, I try to explain why. Usually they are very understanding and open to other options. One of my favourite parts of the renovation process is collaborating with clients and seeing their excitement begin as all of the details begin to take shape, and the vision becomes more and more of a reality. What’s the hardest part of designing a kitchen renovation? The great thing about a renovation is that you can work within an existing space to create a totally new environment that is sometimes unrecognizable. Ironically, this is also the hardest part! Working with the existing walls, plumbing, windows, electrical, etc. is typically the biggest challenge when tackling a new project. Us designers like to dream up these great kitchens, and I can tell you that not once will the trades look at the plan and say, “sure- no problem!”. There is always something that needs to be reworked, whether it is simply redirecting a cold air return into a toe kick, or the bigger jobs like replacing supporting walls with beams or moving plumbing to accommodate for a new dishwasher location. We try to make note of these things while designing the kitchen of course, but it is usually not until the demo is completed that we find out the full story of what it is we have to work with, and work around. Describe the biggest transformation you’ve ever been a part of completing. Without a doubt the largest transformation was a house located on an acreage just east of the city. It had an attached double garage, two bedrooms, one small bathroom, and a really unique addition space with large windows and a vaulted ceiling that was being used as a second living room. The space had a ton of potential to become what the owners wanted, which was a three bedroom, two bathroom home with an open space main living area featuring a large kitchen, dining area, and living room. By converting the garage into a part of the living space, we were able to add in two bedrooms, a three-piece bathroom, and a laundry/mudroom to the old garage alone. The homeowners had the wonderful idea to move their master bedroom to the room with the vaulted ceiling, and we were able to find space for a spacious ensuite, walk in closet, and even a walk-in pantry with easy access to their new kitchen. As you can imagine, this was a massive undertaking. New plumbing had to be run, all new electrical installed, almost all new drywall with updated insulation, new ceiling - it really was almost an entirely new house! And that was just the interior. The exterior received a new roof, siding with cultured stone detail, concrete patio, and a new fence. From the planning stages to completion, this project took just about a year. Stay tuned to our social media to see the unbelievable before and afters of this massive transformation! What are the 3 most common wish list items your clients have for kitchen design? Clients are always hoping for more countertop space, more storage, and large island for workspace. Sometimes accommodating all of these can be tricky if it is a small space, and an island is not always workable. But no matter the area we have to work with, we always work hard to come up with creative ideas so the clients space gets as close to their dream kitchen as possible. What are some of the worst designs (bathroom or kitchen) you’ve ever encountered? How did you fix them? It is not that is was a horrible design, but there is one en-suite we are currently working on that I feel had a lot of wasted space. It was actually a very large for a bathroom, but lacked any sort of functional storage, had a large corner tub that took up a lot of the space, and had a tiny shower. We have since redesigned it to straighten out the awkward angled walls to accommodate for a more functional vanity and tall storage, a free-standing tub, and a larger shower. This also increased the size of the walk in closet, so it is a win-win! The “after” will actually be the same square footage as the original, which goes to show how the right layout can make a world of difference. Tell us about your favourite bathroom design project. 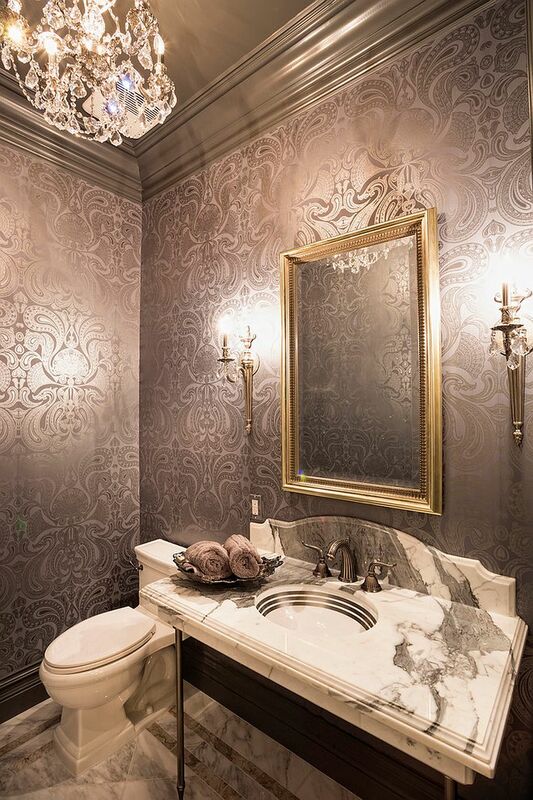 Going off of the last question, this same bathroom happens to be one of my favourites as well. 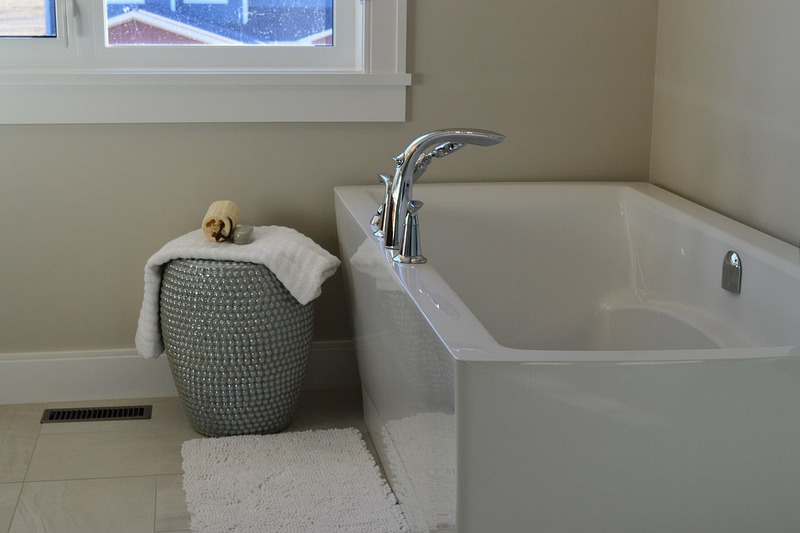 The client has picked a gorgeous free-standing tub and very sleek plumbing and lighting fixtures. 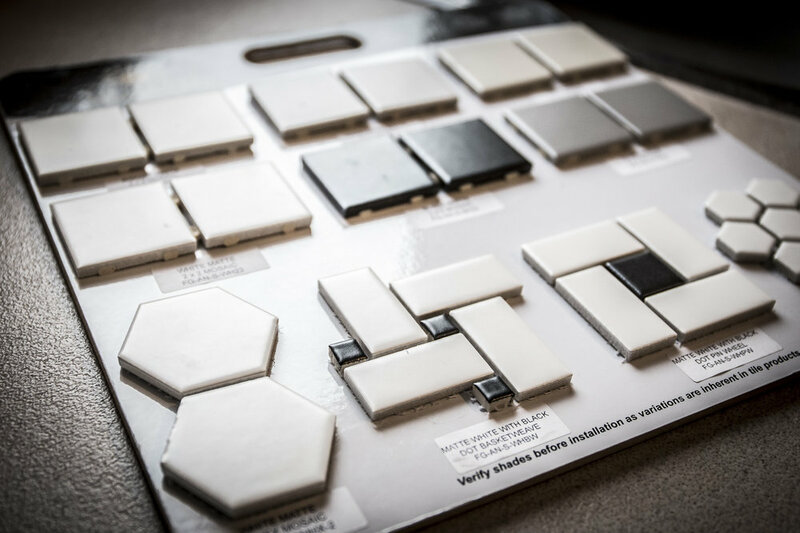 A lovely almost-black tile will be laid out in a herringbone pattern, which will be a beautiful contrast against the high gloss vanity and white quartz countertops. Stay tuned for the after photos! 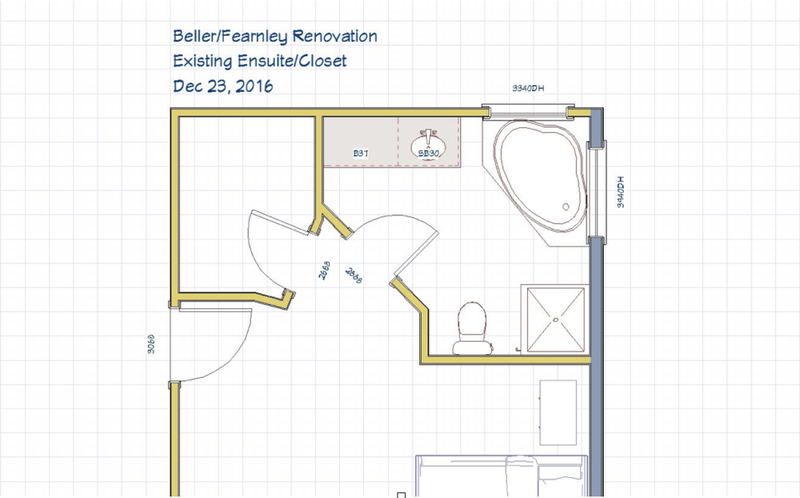 What are some of the execution challenges of designing a new bathroom? As fun as it is designing a new bathroom, they certainly come with their own challenges. Much like the kitchen, you have to consider the existing plumbing and walls. You don’t want to break the client’s entire budget just by moving the toilet from one end of the room to the other. You also have to get fairly creative with bathroom storage, but incorporating a built in shower niche, and tall vanities with adjustable shelving can make a huge difference. Execution wise, don’t forget that someone will actually have to get these products into the bathroom itself. Unlike with new construction, in renovations we typically do not have the luxury of being able to bring up the tub in a crane while things are still being framed. We often have to go with a three or four piece tub/shower combination as opposed to a one piece, as those can sometimes be impossible to get upstairs or through doorways. How to you make designs feel personal? Every client we work with is different, so accordingly every design we create is custom made for that person. We always discuss how they intend to use the space, as well as how they want to the space to make them feel, and use that as direction for the duration of the design process. I always keep in mind that this is where the client will be spending large amounts of time, whether they will be hosting special celebrations, or simply making their daily morning coffee. Whether it is an extra pull out pantry for the avid cook, or the refinished kitchen stools that used to belong to somebody’s grandmother, we try to incorporate special details so the space is unique to them, and really feels like home. The right designer is the difference between a renovation you’re happy with and a renovation you love. From home décor to interior design ideas, designers help make your renovation the best it can be, and even a seemingly simple project can take a lot of effort, money, and time without the right advice. 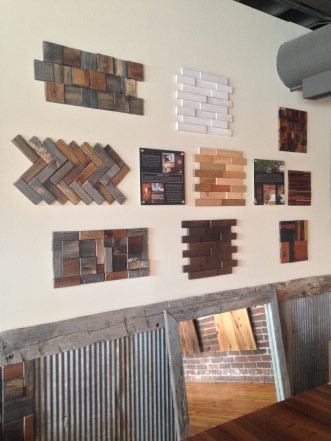 For more planning resources or start your renovation, reach out to an expert like Laura at Jostar today. Dining Areas: What Seating Arrangement Is Right For You? If you’re planning to start your Edmonton kitchen renovations this spring, it will be crucial for you to decide on a dining area seating arrangement that is right for your lifestyle. There are many styles and options available, each corresponding to a particular set of dining needs based on the daily activities that occur both inside and outside of your home. The best kitchens balance great design with functional form, so you can use the following guide for kitchen inspiration to help you select a seating arrangement that is the right fit for your lifestyle. The Lifestyle: Compact homes that don’t require lots of seating. High tables tend to be elegant and sophisticated. They are great for small homes and condos with more compact layouts because they take advantage of vertical space rather than horizontal space. A high-top table arrangement is best for young professionals and couples who don’t require lots of seating and want to create an upscale feel without adding large, cumbersome furniture to their design. The Lifestyle: Busy homes that contain multiple seating areas. A bonus booth is a great addition to kitchens and homes with multiple eating areas. Adding a booth to your kitchen design is also a great way to take advantage of an unused nook or alcove. Booths are an ideal fit for large families, and they can allow for two separate dining areas, so there can be a pizza study session at the bonus booth, and a cozy dinner party at the primary dining area. The Lifestyle: Traditional family dining. Sometimes you just can’t beat the classics. A classic height kitchen table with traditional dining chairs is well suited for small families, or young couples creating a kitchen to grow into. Edmonton interior design is all about infusing personality and personalized needs, so classic doesn’t have to mean boring when it comes to your dining seating. Jazz up your home decor with unique centerpieces, or even consider trying out mismatched dining chairs for a completely unique look. The Lifestyle: On-the-go diners who only need smaller in-home seating options. You may not need a typical kitchen table at all to create the perfect dining area for your lifestyle. Singles or busy young professionals that don’t often host or eat at home may benefit from simpler interior design ideas for dining such as a cozy bar or dining area, which can then free up extra living space. The Lifestyle: Social homes that often host large crowds requiring group seating options. Do you often have large crowds at your dining table? Have you ever hosted an entire little league team? If so, you may way to consider a kitchen table with bench seating. Benches are ideal for busy families that are growing or households that do a lot of hosting because it’s easy to cozy up or spread out without having to count chairs. Benches can seat a lot of kids comfortably, and a natural wood or statement colour bench seating solution can liven up your kitchen renovation too! The right seating arrangement depends entirely on you and your unique dining needs. When you need help choosing an arrangement, Jostar is always just a phone call away. Check out our full kitchen renovations workbook for a complete guide on how to start your next Edmonton interior design project. If you’re planning kitchen renovations or an interior design change in the new year, you’re going to want to know what the latest trends and styles will be. There’s nothing worse than seeing an incredible new look in Edmonton interior design and thinking to yourself “I should have done that”. So don’t worry – Jostar has you covered. 2016 was all about monochrome, so we think it’s about time for a change. 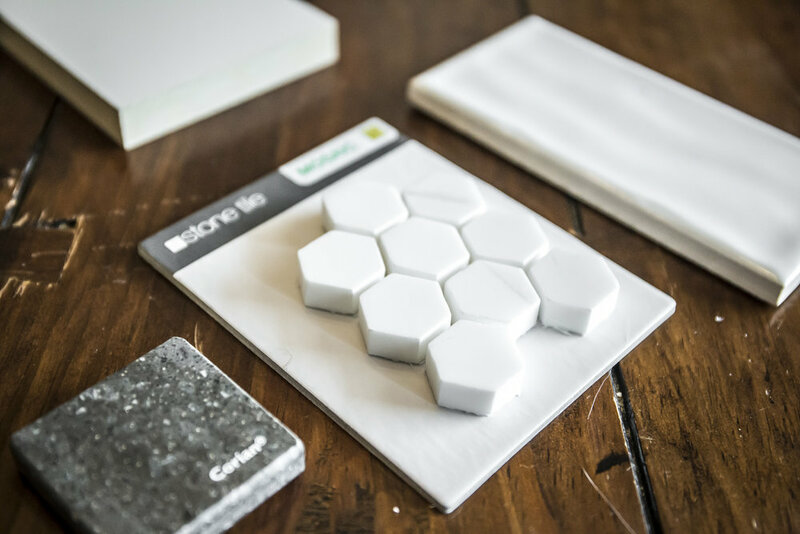 We’re excited about patterned tiles for backsplashes, and even bright, bold accents for unique and beautiful home decor. If there’s a colour or pattern you love, we say go for it. Who says you can only have one? 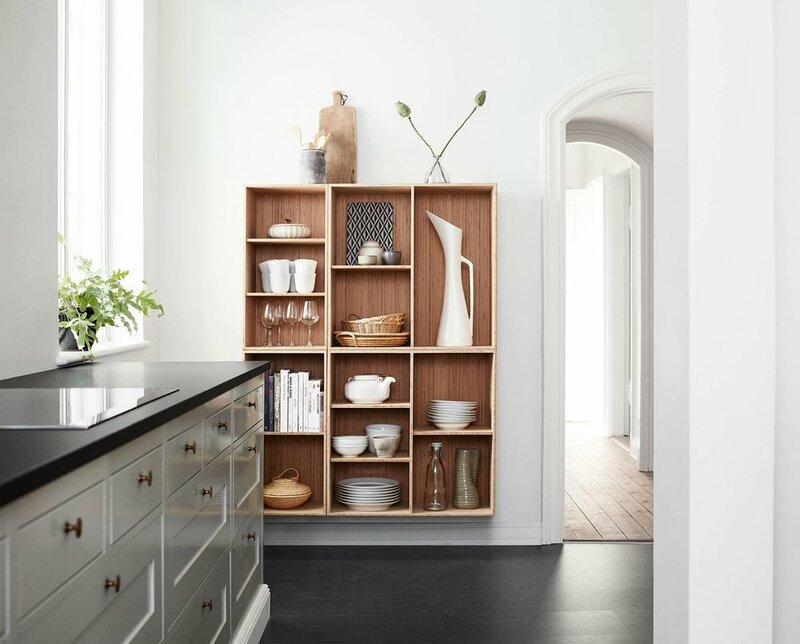 More and more, we’re starting to see interior design ideas with upper and lower cabinets of different colours and even a mix of finishing options. Different metallic features can look amazing together, so we see no reason to force them apart. Again, we’ve seen a lot of wood and brick in previous years. 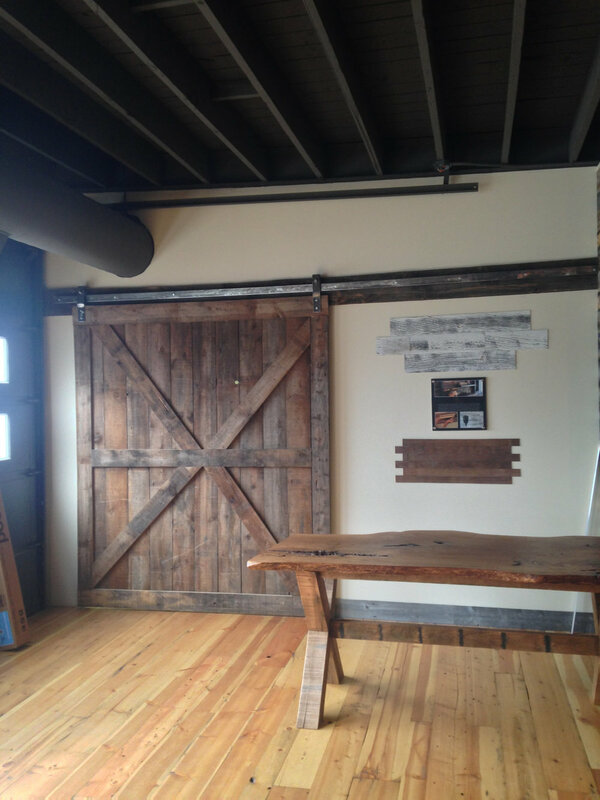 While we love the open brick/barn door look, 2017 may be a time to welcome new textures and elements. Consider terracotta accents or hints of cork to give your space warmth and texture in a new and fun way. As technology continues to advance at an incredible rate, our advice is to pay attention to the latest innovations and consider them in planning your kitchen. For example, sinks with touch sensors have really taken off, so make sure you allow room above your sink to accommodate a taller faucet. We don’t know what the next big breakthrough will be, but giving your appliances room is a great step to make sure you’re ready for innovation in years to come. There are no rules that say you must put your oven near your sink. In 2017, we expect to see more families pay attention to what they use their spaces for, and then design around their personal needs. Perhaps you want a customized storage island for your specialty baking supplies, or maybe you want to add a nook that will double as a homework area. Your kitchen should make your life easier, so we say anything goes. Always remember, your kitchen design should be a reflection of you. We believe in personal style, and the best kitchens are those that suit the needs of those who will use it! When you’re ready to start your new kitchen, we’re here to help.